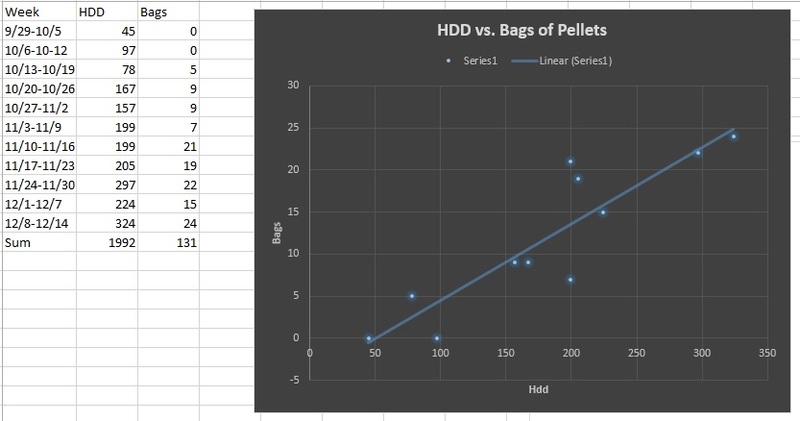 The HDD’s reported from Weather Underground was 324 for the week of December 8-14 and I used 24 bags of fuel, more than would have been calculated by a simple ratio based on last weeks fuel usage, however very close to the trend line of the original scatter plot which I will post again here. So as time goes on the prediction gets a bit better. It’s shaping up to be about 13.5 HDD’s per bag of pellets, I have made minor changes to the software so, I think these numbers are getting more stable as time goes on. Note that December 2012 for the first two weeks added up to 431 HDD compared to December 2013’s first two weeks 548 HDD.